The Christian Experience Weekend (CEW) is a personal and spiritual renewal experience for adults and young adults who want to begin or renewal their relationship to Jesus Christ and the Christian faith community. 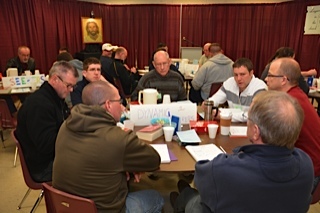 The weekend format is based on the cursillo experience which was designed to help participants encounter themselves, experience the presence of Jesus Christ, and appreciate the importance of participation in a faith-based community. The CEW weekend begins Friday evening and ends Sunday afternoon. It features witness talks by various individuals, who share their personal experiences of encountering Jesus Christ in their lives. The format incorporates opportunities for discussion, prayer, and private reflection, which reminds us of the importance of recognizing the presence of the Divine One in our own lives. For Catholic participants there is an opportunity to celebrate the sacraments of Reconciliation and Eucharist. Who Should Attend a CEW? • Individuals who have no church or faith home, but are interested in becoming Christian. something is missing in their lives. • Practicing Christians who wish to renew or deepen their personal relationship with Jesus. the world around them and in the community of faith.